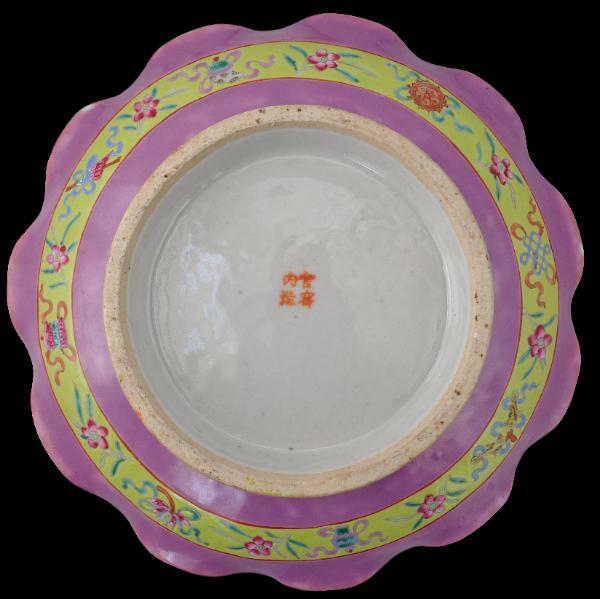 Shallow dishes in this form, with a low ring foot and scalloped edging, were used as offering dishes on Straits Chinese family altars. It is likely that they were commonly used in pairs, although these days, pairs are rarely encountered. This pair is also unusual in that the lime green and rose pink enamel combination is not frequently encountered. But what is particularly unusual is the wide, green band with blossoms and Daoist symbols that runs along the underside of the rim of each. 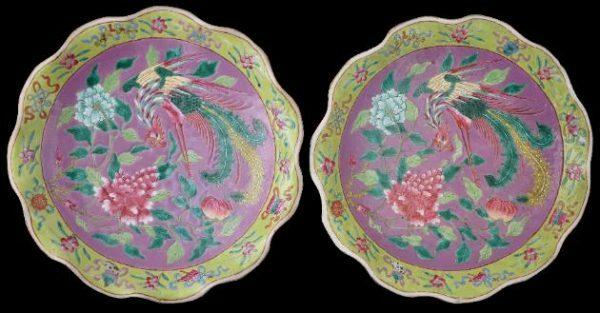 The dishes are otherwise decorated with the usual Straits Chinese motifs of phoenixes and peonies within borders of blossoms and Daoist symbols. The phoenixes are particularly colourful with multi-coloured neck feathers and each with a prominent, central yellow-green tail feather. The edges have been gilded. The feet have been decorated with repeated hill or rock motifs in green enamel. The bases of each are stamped with the Chinese characters for ‘Made at Imperial Kiln’. Almost certainly the dishes were not made at the Imperial Kiln; the maker added the mark to give an inflated sense of the quality of his work. Both dishes are in almost perfect condition. Both are free of any cracks (hairline or otherwise) and restorations. There are several very minor chips to the glaze here and there as is usual with nonyaware. These could easily be remedied if felt necessary. The decoration is crisp and the pink and green grounds are evenly applied. 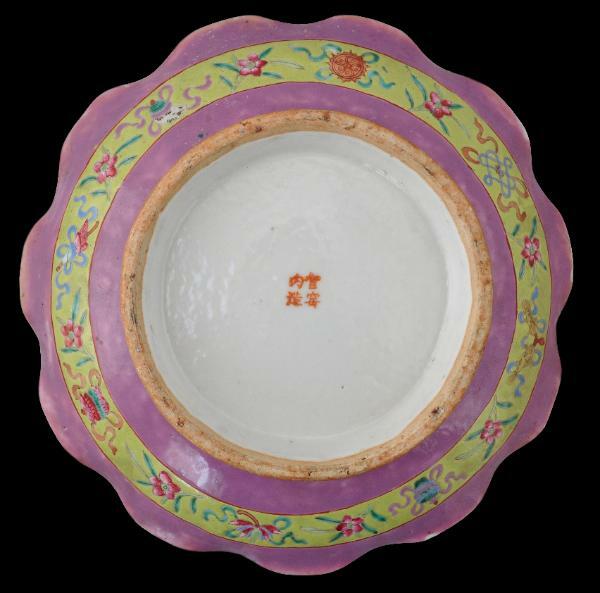 Overall, this is a rare opportunity to have a matched pair of offering dishes, of good size, and with rare decoration. Ho, W.M., Straits Chinese Porcelain: A Collector’s Guide, Times Books International, 1983. Kee, M.Y., Straits Chinese Porcelain, Kee Ming Yuet Sdn Bhd, 2004. Kee, M.Y., Peranakan Chinese Porcelain: Vibrant Festive Ware of the Straits Chinese, Tuttle Publishing, 2009. Khoo, J.E., The Straits Chinese: A Cultural History, The Pepin Press, 1996.